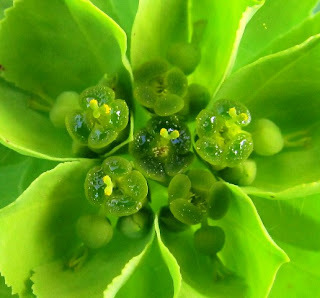 Euphorbia helioscopia (Euphorbiaceae family) or sun spurge (γαλατσίδα) is native to most Europe, Northern Africa and Asia. Other common names are ward spurge, umbrella milkweed and madwoman's milk. The name of the genus comes from the Greek physician Euphorbus, and the name of the species referes to the capability of the plant to turn towards the sun. When the plant is cut a milky juice flows and the greek common name galatsida (γαλατσίδα) indicates this. This sap is supposed to be a laxative (and highly poisonous). 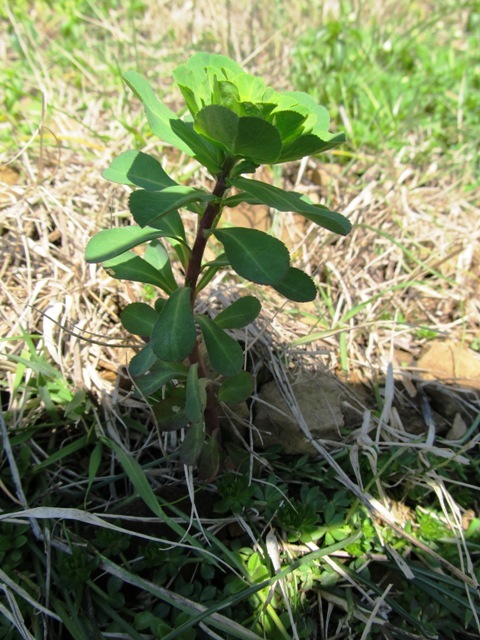 The name spurge comes from the middle english espurge (=laxative). The inflorescence is yellow-green with 4 petals. The stem is reddish. It is considered to be a weed in agriculture. I like the Euphorbia. It's specialty of mother nature. I think this plant looks beautiful, even if it's poisonous. A ja mam wilczomlecz w ogródku i bardzo mi się podoba. Pozdrawiam. *** Και έχω μια ευφόρβιο στον κήπο και μου αρέσει πολύ. Δικός σου.